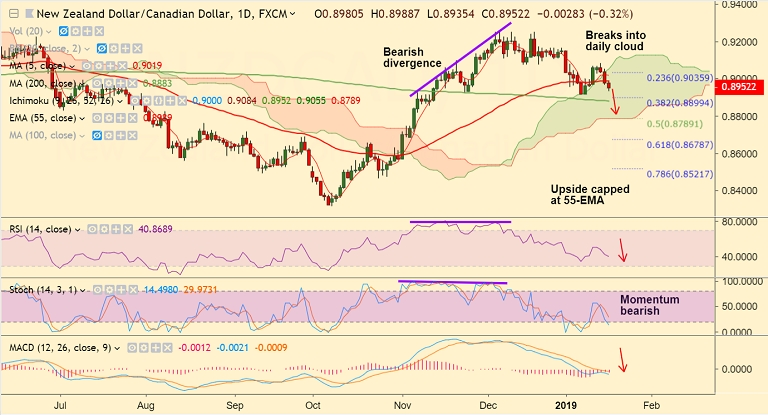 NZD/CAD breaches cloud support and extends weakness for the 3rd straight session. Antipodeans hit by the latest report that the US-China trade talks could be delayed, in light of the US shutdown. Canadian Finance Minister Bill Morneau was on the wires late-Wednesday, said that Brexit not a problem for Canada. Technical indicators are bearishly aligned in the near-term. Scope for further weakness. Price action has broken below 55-EMA and is on track to test 200-DMA at 0.8883. On the weekly charts the pair is edging lower from upper Bollinger Band. Is holding support at 0.8930 (55W EMA). Break below 200-DMA to see further weakness. While on the flipside, break above 20-DMA to see minor upside.